Welcome to the Kangaroo Korner, a blog produced by Jones House Interns. The Jones House offers internship opportunities during the school year and summer for both current WFS students and alumni. Interns assist the Alumni/Development Office with various tasks involving alumni and student outreach. This past summer, I went on the El Paso trip. What was originally a ploy to get my service hours turned into a life-changing adventure. Not only did I learn about the current immigration issues in our country, I learned about myself, the people around me, and how one person’s actions can affect an entire community. On the morning of the trip, I felt sick to my stomach. To be completely honest, I was nervous to be away from my phone for a week, but more than that, I was nervous to be with a new group of people, to be halfway across the country, and that wouldn’t I be able to make an impact in a community so different than my own. On the first day of the trip, we were immediately welcomed into Pastor Rosemary’s church, Cristo Rey. They had two tables of food ready for us to dig into after our long day of travel. After that, we walked back to a different church where we would all sleep. Besides the crew from WFS, we were accompanied by two members of the World Leadership School, Michelle and Vicky. They led a few group bonding activities and shared stories of times when they had life-changing experiences. By the end of the first night, I felt more bonded and connected to the entire group than I had ever expected. Day two was probably the hardest day of the entire trip. We visited three different El Paso communities that varied in levels of poverty. The first was a small community center that had a dance room, a small medical exam room, and a classroom where they taught English. The next place we visited was the home of an undocumented immigrant named Soledad. She lived in a one-room house and made her living by selling crafts. We helped clean up her yard after hearing her story. The final house we went to was in the most impoverished area. There was no running water or electricity. The woman told the story of how her husband had been deported, leaving her without work and needing to support two children. He made multiple attempts to come back into the country to see his family, and in the end, he returned with much effort and danger. Although he still had issues with finding work, he was reunited with his family. This woman and her husband’s story brought almost everyone to tears. We were all amazed that she was able to be so open about her life to complete strangers. We also talked to her daughter, a high school student just like us. Questions like “Where do you want to go to college?” and “What do you want to do in the future?” were asked. Her answers were, simply put, normal; she could have been a WFS student herself. This gave me the realization that although we come from very different communities, we are all so similar. People should not and cannot be divided based on income, immigration status, or anything else of that matter. We returned to the church for some free time spent playing card or just relaxing. I have to say, it was nice that no one had any electronics. It made us actually spend time together-- imagine that! After eating dinner at Pastor Rosemary’s church, we drove to a high point that looked over all of El Paso and watched the sunset. We had, in the usual manner of Quakerism, a short Meeting for Worship to let our experiences of the day sink in. The next few days of the trip were packed full of awesome experiences. I wish I could write about all of them, but that would probably end up being ten pages. They say a picture is worth a thousand words, so I've included a few here. Over the course of seven days, I faced all of my fears (including my fear of heights when we visited the high point that overlooks El Paso!). I faced my fear of being surrounded by a new group of people, of being in a new community, and of missing a flight! I learned that one person can make a huge difference in multiple communities. Pastor Rosemary, for instance, was the reason we were able to go to three different areas of El Paso on the second day of the trip. She knew the manager of the community center, and often recommended it to people who went to her church. She knew Soledad who sold her crafts and invited her to make work at the summer camp. She connected her with groups like us who wanted to hear her story and could help take care of her home. Pastor Rosemary also connected us with the woman who lived in a home with no electricity and running water. When the woman’s husband finally returned, he went straight to Pastor Rosemary’s church because he knew that she would be able to help. Pastor Rosemary also organized the summer camp so that parents with children could work during the day. She brought together two seemingly opposite groups: Us, who grew up in a privileged part of the US, and immigrants who went through tremendous struggles to find a hopeful future in America. On paper, we sound like opposites, but in reality, they are just like us. We all have dreams of prosperity for our families and future generations, as well as the hopes and goals of receiving a higher education. But, most importantly, we are all connected by our need to make a lasting change in the world. Spending a year abroad is one of the most extraordinary experiences a student can have. Students at Wilmington Friends School are presented with the opportunity to do just that through School Year Abroad (SYA). Depending on which language they are learning, students can spend a school year learning and exploring in Spain, China, Italy, or France. SYA consists of 45 member schools from across America; WFS is the only one from Delaware. WFS has been a member school since 2007. Atim Kilama ’18, Ali Miller ’19, and Ali’s dad, Gregg Miller, were kind enough to share their firsthand experiences with SYA. Atim spent her junior year with SYA China, while Ali is currently spending her junior year with SYA Spain. Mike Benner, the WFS SYA Coordinator, graciously took the time to share some other information about SYA and what it means to WFS. SYA is more than just learning a language, which is evident in what Ali, Atim, and Gregg had to say. When Gregg visited Ali in Spain over winter break, he was very impressed with her level of confidence and “how she just jumps in and schedules bus and train trips, talks to waiters, checks in at hotels, even bargains with vendors.” Ali has homework assignments to walk around the city of Zaragoza and talk to some of the locals. 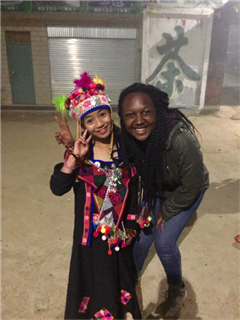 Atim’s favorite part of SYA was the trips to different provinces in China at least once a month. Participating in extracurriculars is also encouraged. During her first semester in Spain, Ali played ping pong, took a sevillanas (traditional Spanish dancing) class, took a cooking class, participated in Joven Erasmus (a program where Spanish and American students got together once a week to discuss some of the differences between the two countries), and swam. While in China, Atim participated in karate, swam for an international team, and participated in the bilingual club. Ali believes that the biggest advantage to participating in SYA is that she gets to experience a new and different culture and lifestyle. Atim has very similar feelings about the advantages of participating in SYA: “It broadens your mind about the world and how other people in different countries live. Here in America we are so caught up in our American lifestyle that we never stop to think about how other people live and what their culture is like... I got to experience the Chinese culture first hand and also learn Chinese history, so it definitely helped me broaden my mindset.” Everybody who has participated or been involved in some way with SYA recognizes that the benefits extend beyond just learning a language. The language is not lost among the extracurriculars and travel. Both Gregg and Ali mentioned that a few weeks after arrival, every student had to sign a contract saying they would only speak Spanish in school except for certain situations, such as in math and English classes. Ali seems to find this rule annoying yet helpful: “It is difficult at times to stay with the rule; however, we all know how much it is helping us in the long run. Every day I feel more and more comfortable with my speaking and understanding skills, and every day I learn something new.” Atim feels the most important thing she took away from her time in China is being able to hold full conversations with native Chinese speakers. She was able to learn six years of Chinese from only living in China for one school year. 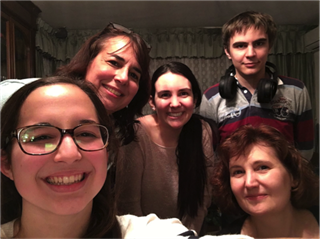 Ali said her Spanish skills have improved “tremendously” since she started living in Spain. SYA has vastly improved the language skills of everyone who has participated in the program. Ali and Atim agreed that they would not have participated in SYA if WFS was not a member school. Their interest in studying abroad was sparked when they watched the presentation on SYA given to all students at WFS during their sophomore year. After watching the presentation, Ali knew SYA was for her right away: “I had always been living my life waiting for everything to become exciting; to travel the world, to make fun memories. All I wanted was just to not be on my same everyday schedule, and once I learned about SYA, I instantly knew it was for me.” Atim decided to participate in SYA because she felt that it was a great opportunity to do something most people her age do not have the opportunity to do. Mike noted the advantages of being a member school: “As a member school, we have an ongoing relationship with SYA. This means that SYA is familiar with our students and our program, and the admissions cycle is understood by everyone. This benefits our students by ensuring that they receive up-to-date information on SYA programs, as well as guidance in the application and financial aid process.” Being a member school also helps demonstrate WFS’s commitment to world language instruction, global education, and cross-cultural understanding. The athletic program here at Friends kicked off the school year with a very successful fall season, and as winter sports are beginning students and coaches are looking to continue this success throughout the rest of the year. Five different fall sports are offered; football, volleyball, field hockey, cross country, and boys soccer, giving students many opportunities to play the sports they love. Football had an especially memorable season this year, going 8-1 in the regular season and becoming conference champs before a heartbreaking loss in the semi-finals of the playoffs. Volleyball, Field Hockey, and Boys' Soccer all made it to the playoffs as well, and Cross Country performed very well at States. Quaker Athletics clearly had immense success on the team level, but there was also a great deal of individual success as well. We had athletes named with all-conference and all-state titles across nearly all of our sports, and Junior Connor Nisbet became state champion in Cross Country for the second year in a row. While these accomplishments are impressive, what stood out to players, coaches, and parents the most during this fall season was the camaraderie and team spirit across all sports teams. Friends is without a doubt an extremely tight-knit community, and this is apparent to everyone who has witnessed one of our teams play. As a Field Hockey manager this year, and player in past years, I have seen this sense of community and school spirit first hand, and it is very special to be able to play for and be involved with sports teams that are so close on and off the field. As we enter the new year and the winter sports season, we hope to continue these athletic achievements here at Friends, but regardless of the scores, or our season records, our sense of community within each of our teams will continue to set us apart. My name is Tony Bennett ‘18 and I am a student intern for the Alumni/Development office at the Jones House. To be honest, I was moderately reluctant going into this experience. I was worried that I was not that prepared for working in a professional office at School. To make matters even more difficult, I did not even know what went on at the Jones House. I only knew that it had something to do with coordinating some of the events that went on at School. Even with all of this in mind, I decided to take a step out of my comfort zone and engage more with my school and accept this internship. I also figured that the school had given me so many opportunities and support, that I should do anything I could do to give back, even if it is in a small way. As I began my internship at the Jones House, I was surprised about how welcoming everyone was there. Right off the bat, they made me really comfortable, and excited about working with all of them. Right away, the Jones House team assisted me in hitting the ground running. I jumped right into helping out with the planning for Annual FUNd February, like the WFS Flat Kangaroo Photo Contest, helping out with some of the logistics for the Quaker Quiz Night, and writing articles for the Annual Report. All the while, I was learning about philanthropy as a whole, and what it means to WFS. While doing so, I was amazed when I heard some of the stories of people that went to Friends, just like me, and how much of an impact it had on their lives. As a result, I have really become more appreciative of the School in general, and have become more aware of how special this place really is, while working on making it even better. My work at the Jones House has been fun, worthwhile, and above all else, rewarding. It has been really cool to see some of the things that I have been working on, along with other members of the Jones House Team, come to fruition and blossom thanks to our hard work and creativity. It has also been incredibly rewarding because I have been constantly learning new things about the school community and gaining professional work experience. All in all, it has been really fun and meaningful to connect with all different types of people that go to (or went to) Friends, just like me. My name is Kat Nix, I am sophomore at WFS, and currently an intern for the Alumni/Development Office at the Jones House. I have been interning for several weeks now and from the start, it’s been an interesting as well as fun journey. When I first heard about the position I wanted to apply as soon as possible. I have always wanted to be an intern in order to get experience and develop skills for the workforce. Going in, I have to be honest, I had no idea what happened in the Jones House! I knew I’d be involved with the alumni work but in all my 12 years at Friends I never once discovered what they did over there. Still, I was so excited to be able to come and work in the Jones House and to actually find out what kind of work they did and what kind of work I would be doing as an intern. From philanthropy to kangaroos, it seemed like I would be involved in a wide range of activities both involving my current peers and former ones. I’ve always been passionate about outreach and am always involved with working with others, and this internship is all about that. So far my main project has been working on the Flat Kangaroo photo challenge in the upper school. I was tasked with developing different proposals for plans of involving the student body during Annual FUNd February. The Jones House team had already been planning a social media platform to use for community involvement and I thought that it was a great idea. Using social media in order to reach out to teenagers seems pretty logical quite frankly. We’re always on it! From there, my fellow intern Tony ‘18, and I, workshopped different ideas along with the Jones House team and together, we created a Photo Contest using different social media platforms. The way the contest works is: students take pictures with the #WFSFlatKangaroo that can be found online/around school and submit it to the various Friends School social media accounts such as Instagram and Facebook. Students can win prizes for a Dress Down Day for the most creative photo by Advisory, an El Diablo gift card to the most creative person in each grade, and a gift card for the best photo overall. Tony and I have been publicizing it around school and trying to boost involvement in the contest. Working on the project has been a lot of fun and I’ve enjoyed helping with such a creative and fun idea. Thus far, my experience at the Jones House has been more than enjoyable and I’ve learned quite a bit about interning and more about the School itself as well. I can’t wait to continue! My name is Virginia DeWees. I graduated from WFS in 2012 and recently graduated from Hobart and William Smith Colleges in May of 2016. I don’t want to say life in college was easy, but the stressors in college are very different from the stressors of the “real world.” My experience with such “stressors” have been relieved to a certain degree due to the enlightening work I have immersed myself in since my graduation from college. For the fall of 2016, I have been interning at Wilmington Friends School in the Jones House learning the foundations of non-profit development and giving back to the school I attended for thirteen years. My experiences as an intern here in the Jones House have been incredibly fun, meaningful, supportive, and gratifying. Not only do I get to work with an amazing team here in the Jones House, but I also have the opportunity to work on my own projects, refine the skills I brought with me at the beginning of the school year, and learn new skills. It is an incredibly powerful feeling to be able to come back to WFS as a volunteer and do the best I can to provide the current students, staff, and faculty with the support necessary to have an amazing experience at WFS like I did as a student. As I have learned from a few of my friends who recently graduated from college, post grad life can be scary, daunting, and lonely. I am fortunate and privileged to have the beginning of my post grad life filled with support, kindness, peace, and generosity thanks to the opportunity WFS has given me to volunteer in the Jones House. Being able to return to my roots here at WFS after being away for four years during college has been very fun and powerful for me. I have gone through a lot of transformation since I graduated from WFS almost five years ago, thus it is really fun to be able to come back to the School, interact with old teachers and staff members, and share experiences with them as a peer. Being a student at WFS for thirteen years carved a very special place for WFS in my heart; therefore, it means the world to me to be back in my roots as I figure out next steps for my own future. I am excited to announce I have accepted a position here at the Jones House as an Advancement Associate for the spring of 2017. I look forward to more experiences here at WFS and to continuing to make an impact on this amazing institution. We have all probably seen the Welcome to Wilmington sign a thousand times on our way to school. “A Place to be Somebody” it excitedly claims. While the Wilmington sign can be perceived as hackneyed, it resonates with me deeply. I do not think Wilmington is a place to be somebody; quite the opposite really. I believe Wilmington Friends is truly a place where anybody and everybody can be somebody. Wilmington Friends has shaped my college experience in ways that I could never have imagined. Everybody and anybody is somebody at Friends. Nobody simply graduates from Friends. Everybody has a legacy that they leave at Friends. Whether that is through sports, academics, art, or music, everyone recognizes the extreme talent of each individual student in at least one of these categories.. Unfortunately, Wilmington Friends is not the real world. Going from the sheltered walls of Wilmington Friends to the rigorous grounds of William and Mary was a tough transition, for me personally. This is not because I was ill prepared for the academic rigors of college life. On the contrary, I have been able to manage the stress of college academics with ease thanks to my Wilmington Friends education. What I was ill prepared for was the mental strain anonymity would put on me. I had a name at Friends; I had a reputation at Friends; I had a legacy at Friends. At William and Mary, I had none of that. This post is not meant to be a gripe about me thinking I deserve credit and recognition, or that I wish I was still at Friends.. If you continue to read, you will see that, thanks to Friends, I have the drive to stand out. Thanks to Friends I have the drive to be a leader in anything I do. Thanks to Friends I will always work to be somebody. I know I have to work hard to leave a legacy and make a name for myself, but I also know it is worth making a name for myself. I learned this both from going to a small school like Friends, and going to a public university like William and Mary. Throughout college, as a Psychology and Philosophy major, I have worked harder in my classes. I’ve also trained harder as a runner, all in the hopes of making a name for myself and leaving a legacy at William and Mary. Anybody and everybody is somebody at Wilmington Friends, and anybody and everybody who were somebody would never want to become nobody again. After completing my first year at Pomona College and returning back home for the summer, I have had much time to reflect on my own experience and am very curious about my classmates’ experiences, what they’re doing now, and their future plans. The three Class of 2015 members whose experiences will be highlighted are Steven Ly, Sarah Brennan-Martin, and Jake Leviton. Steven took his first year at UD to completely immerse himself in the career in medicine that he is currently pursuing. The bulk of his schedule consisted of science prerequisites; outside of the classroom he became involved with the Phi Delta Epsilon Medical Fraternity, a club called Making Doctors, and joined the University’s Medical Scholar’s interest group. Steven also committed himself to community service like the fundraising work he did for the Children’s Hospital of Philadelphia (CHOP). He is now back home for the summer and balancing work and volunteering at a Newark Urgent Care facility to fulfill the hours required to apply to the Medical Scholars Program. A little further up the coast, in Brooklyn, New York, Sarah attended Pratt Institute with an interest in fashion design. She took full advantage of the resources available to her and took classes that centered around things like textiles, draping, fashion illustration, etc. She also had the chance to take a few art history courses and subsequently decided to minor in art history. The location of Pratt in the heart of Brooklyn makes it a very opportune place for aspiring artists and designers. Sarah found herself in the right place at the right time during the latest fashion week, where she had the opportunity to help with the choreography for the Tommy Hilfiger rehearsals! On top of all of that, Sarah continued her commitment to athletics and joined the Institute’s track team. She is now back home in Dover for the summer, taking it easy and relaxing away from the madness of the bustling city for a little while. All the way across the Atlantic Ocean and the Mediterranean Sea is where we find Jake Leviton, who took a gap year in Israel. He split his time there, spending the first semester in the city of Bat Yam, and the second in Jerusalem. He was based in the middle of the desert in Sde Boqer where he did basic training as part of the Israeli Defense Force's education unit, and went home every other weekend to Bat Yam. He was also immersed in academics during his time there, studying things like comparative religions, the Israeli-Palestinian conflict, and the Hebrew and Arabic languages. In his free time, Jake hiked and explored through many beautiful parts of the country. Reflecting on his experience, he values most the opportunity to have seen so much of the country, to have met people from all over the world, and to have had the opportunity to practice both Hebrew and Arabic. After quite an amazing gap year, Jake will be attending the University of Pittsburgh in the fall. Just from these stories alone, it is evident that the Class of 2015 is doing great things and partaking in an awesome diversity of experiences. I couldn’t be more excited to see what else my classmates will find themselves involved in in the future! The journey beyond Friends is already proving to be a great one, full of nothing but potential. Spring has sprung here within the WFS athletics program and all student-athletes, coaches, and fans are looking forward to what each sport’s spring season has to offer. The spring season means many things to high school students. It is the last stretch toward the end of the school year and start of summer, but to many, spring sports are a long awaited thrill. Boys and girls lacrosse, soccer, baseball, boys and girls tennis, and track and field give students numerous outlets in which to pursue their passion.. Over the span of these seven teams, 187 students in total are participating in WFS spring sports this year. The girls lacrosse team started the season 1-1, splitting their first two games of the first week of the regular season Their opening game, away against Middletown High School, proved to be a good indication of what is in store for the rest of the season. A 10-3 win over Middletown displayed a variety of the team’s strengths and was a great beginning to the season. The same week, two days later, the team experienced a tough, but well fought, loss to Archmere Academy, falling short by only three goals. Even though this appears as a simple loss in the schedule, the team truly held their own against another very strong team, which again demonstrates the character of this year’s group. The following week the team suffered a difficult loss to a conference opponent, St. Andrews School, but they are ready to bounce back with another conference game against Tatnall School. The players and coaches believe that this will make them stronger, and that they have a bright future ahead of them. As a member of the girls lacrosse team, as well as two other sports during the school year, I have been greatly influenced by the athletics program at WFS. I have played sports my entire life, but finally getting the chance to participate in school sports my seventh grade year was a significant point in my life. Since the community at WFS is so close knit, becoming a part of a team with my classmates and friends, and representing the school I have spent now 12 years at, was incredible. I fully believe that the sports program at WFS has changed my life for the better, due to the friendships I have made over the years, and the growth I’ve experienced as both an athlete and a person. I will be forever grateful for the opportunity to represent WFS athletics, and will never forget my six years as a student-athlete.